One of the most fun things to do on vacation in Southern California is bike ride on the Santa Monica beach path. The bicycle path also known as "The Strand" starts at Will Rogers State Beach and travels through all of the South Bay beach communities and 2 harbors: Marina del Rey and King Harbor at Redondo Beach. The bike path ends about 2 miles past the South end of Redondo Beach Pier in Torrance. Depending upon where you park, the distance can be as much as 40 miles round trip - a good all-day workout with terrific views! My husband and I make a point of doing the ride from Santa Monica to Redondo several times a year. Sometimes we start at Will Rogers State Beach (at Temescal Canyon and Pacific Coast Hwy) and head down to Redondo Beach Pier and come back - an all day adventure! Other times, we just want to cruise around the beaches of Santa Monica and Venice and park at one of the lots near the Santa Monica Pier. We'll ride our bikes to Dockweiler to watch the hang gliders, then ride to Manhattan Beach to see some surfers and volleyball action. After that we ride to Hermosa for some food and listen to a weekend outdoor concert at the pier. There are many bike rental places along the bike path especially in the Santa Monica area. Rates are affordable and there bike types and sizes for the whole family. On weekends, the path can be very busy and crowded with lots of opportunities for people watching. On weekdays, the path can be more open and free flowing for a better exercise ride. There are some nice hotels just north of the Santa Monica Pier for vacationers to enjoy the view of the beach without all the crowds, congestion, and noise that occurs closer to the Santa Monica Pier area. A good starting or meeting place to begin your beach path bike ride for sight seeing is the Santa Monica Pier. If you start at the Pier, you will pass through Santa Monica and Venice Boardwalk and then continue on to Marina del Rey. That is a about a 7 mile trip one way. You can stop for food and drinks at the Marina and then continue on to the rest of the bike path or turn around and head back to the pier. Depending on which section you ride, the total trip can range from 14 to 40 miles and is a guaranteed "all-day" adventure. 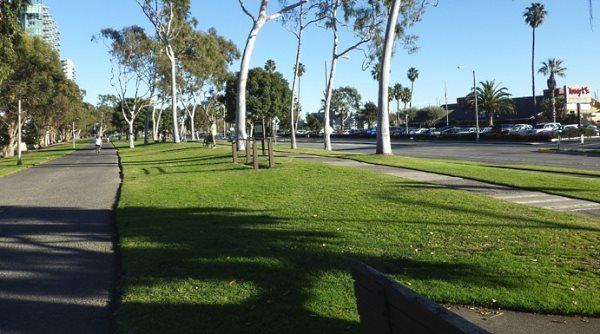 If you choose to begin in Santa Monica, there are plenty of parking lots along Neilson Way ($7.00-$8.00/all day). Along the way, there are restaurants and shops and there are alot of things to see so be sure to bring bike locks, cash, sunblock, windbreaker, water, sunglasses and a bike pump, spare tube(s) and tools (in case of a flat) and you will be set! 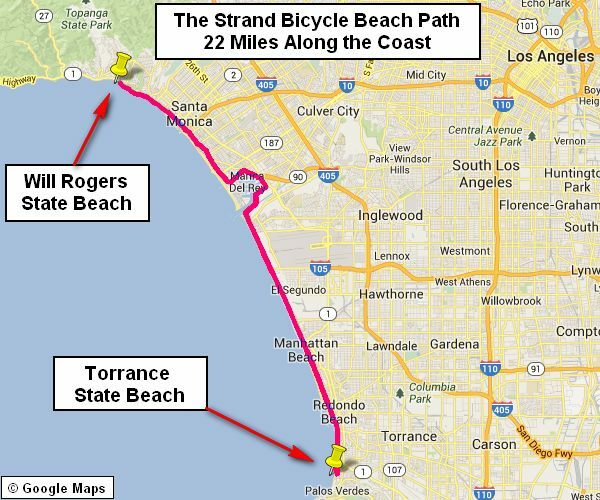 The bike path is accessible from beaches all along the route, but parking and bike rentals are more plentiful in the Will Rogers and Santa Monica areas.